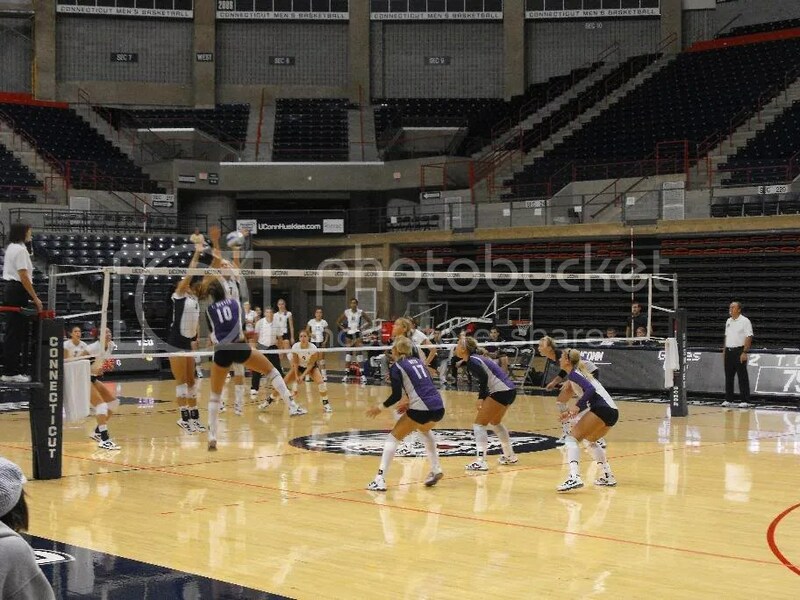 STORRS, CT – With five matches in the books for the UConn Toyota Classic, the team that had traveled the farthest to get there, the TCU Horned Frogs took the court to face the home Connecticut Huskies on a Saturday night. Neither team had lost a match in the tourney and something was going to have to give. In the end the match would go the full five sets and down to nearly the last possible point before TCU edged out a win over the Huskies 15-13 to win 3-2. The pace of the match was set very soon as the nearly point for point battle that would encompass the five sets began. While Connecticut pulled out to an early lead, TCU was the first to reach ten points when the score came to be 8-10 in favor of the Frogs. Texas Christian’s points came off a Kourtney Edwards kill, a Huskies error, Edwards and Megan Munce sharing a block, Edwards again finding a spot just in bounds to spike a ball into, a U of C lift error, Irene Hester whacking a ball off a defender and out of bounds, following a quality defensive save by Lauren Otto, Kristen Hester had a kill of her own, Otto struck again, Kristen Hester served up an ace, and Otto let loose a positive smash for the tenth point. Connecticut’s scoring came through a TCU error, Jordan Kirk’s service ace, a Chauntay Mickens kill, Rebecca Murray’s attack which bounced off a defender and out, a TCU net penalty, Mattison Quayle’s massive spike, a Horned Frogs spike out of bounds, and visitor serve out of bounds. There was some notable defensive saves by Kelsey Maving and Samantha Arriaran during the melee as well. TCU was now in the lead, and Connecticut began to hunt to catch up, with some point trading going back and forth until the Huskies eventually caught up at the 15-15 mark. The home team’s comeback came from a Kirk spike just in bounds, a Lauren Lamberti hammer off the defensive block, Quayle’s smash through the blockers and off a defensive dig attempt following a Jessica Isaac quality dig, another Murray hammered shot off a block, a Quayle HUGE kill following a well placed set, another Kirk kill, and a Murray service ace when the ball flies off a dig. Arriaran picked up another good dig during a long rally early in that sequence. TCU’s had started to pull away off a Christy Hudson kill, and a Munce using a set to good advantage to whack one home, they picked up another point soon afterward, and benefited from two Connecticut errors. Katelyn Blackwood had a slew of great digs against the Connecticut attacks during this period too. Connecticut picked up two more points on consecutive TCU errors, and the visitors called a time out. When play started up again, Murray served a ball off the net and it dropped right into a gap for another home team point. Another TCU attack error put the Huskies up 19-15. A long rally battle ensued, and despite a good defensive save from Murray, Hudson had the last laugh and it was 19-16. Cayla Broadwater and Kirk teamed up on a block which ricocheted off a frog and hit the scorer’s table to put it at 20-16. Otto responded with a kill, but Broadwater & Kirk maintained the lead when their block stuffed a TCU attack. When play began in Set 2 Connecticut pulled out to a quick lead but it was TCU who quickly fought their way to a 7-12 lead. Connecticut’s points came from a Broadwater block, a Kirk kill off blockers, Kirk pouncing on an overpass, a wayward TCU set that sailed over the net, a TCU serve out of bounds, Broadwater and Lamberti teaming up on a block, a Lamberti spike, and Murray receiving a set and blasting it over the net. Texas Christian’s twelve points came from a Hudson attack, Otto found a Connecticut overpass to whap return to sender, Connecticut had a net violation, Edwards unveiled a smash, TCU typhooned a shot in, Kristen Hester delivered a kill, Munce followed that, and Irene Hester had a titanic spike soon afterward, added to that was a Connecticut spike into the net, a Munce service ace which dropped in front of the D, and yet another Kristen Hester kills. Connecticut called a time out. The TO did stop the bleeding and Devon Farrell came out of the gate with a rocket the moment she entered the game. TCU was unable to return the next Connecticut attack, and despite a good dig by Blackwood during the next rally, Murray picked up a point. It was 10-12. TCU would gain the advantage though pulling at head to a 14-19 lead before another Connecticut time out. Irene Hester started off the scoring with her attack, Connecticut’s Kirk responded with a kill, but following that, Hudson and Edwards shared a block, though a net error on the next play put Connecticut back within 2. TCU picked up three straight points thanks to a big time Otto spike which bounced off a defender and far out of bounds, and two Connecticut spikes out of bounds. The set opened up with TCU reaching a 2-7 lead prompting a quick Connecticut time out. TCU opened with a kill, a Edwards and Hudson block, a Connecticut spike out of bounds, a Edwards and Otto block, a home team serve into the net, a Munce kill, and a Edwards spike that was well directed around the block. Connecticut managed a kill from Farrell and Broadwater each. Isaac came up with a key save as well. Following the time out Connecticut began a comeback which would end with each team locked in a 11-11 tie. Connecticut’s next nine points came through a Murray kill off a set, a Farrell smash (following a fantastic dig by Isaac when a TCU rocket flew her way), Arriaran had a one handed put over the net, following a good dig by Farrell, Kirk had a large kill, Kirk and Murray block, another Isaac save set up a massive Broadwater kill, a TCU spike out of bounds, another Broadwater block, and a Arriaran service ace finished up the comeback. TCU in this time put together points off a Munce turning put over the net after a Meghan Horio good dig, a Kristen Hester kill ended a very long rally battle back and forth, Munce picked up a service ace, and soon after she used a light tough to put over a ball in for a kill. The teams would continue their highly pitched match to a 20-20 score after this. Connecticut picked up a point despite good defensive saves by Munce and Blackwood, but UC5 scored on the next play to keep the score even. Arriaran’s fake set worked again as she put it over, but Edwards hit through the block. Lamberti returned fire with two straight kills, Otto responded, and Farrell hit the ball off the blockers to keep the lead at 2, only to have Irene Hester unleash a kill of her own. A two hit error by the frogs returned the lead to 2 for Connecticut but Munce cut it to one. Murray got a running start and sent a spike into a hole in the TCU defense, and Broadwater and Kirk teamed up for a defensive block. Following a great save by Blackwood the visitors roared back with a Irene Hester kill, and a U of C spike into the net. Broadwater had a put over, but TCU scored twice more thanks to Otto and Edwards. Things were about to get very intense, as Kirk launched a kill to regain the lead for Connecticut. On the following exchange, TCU was called on a net violation, the Horned Frogs disagreed with a call and eventually Otto was given a yellow card with things now getting a bit tense. On the following play Otto blasted a meteor into the Connecticut defense that was not returned, and the referee had more words with her, but a yellow card was also directed at Connecticut’s assistant coach. The Horned Frogs were called for a lift error to put the score at 23-21 and TCU called a time out. Play resumed with a long rally, and despite a good save by Arriaran, Edwards came up with a block, and a play afterward Connecticut spiked out of bounds. The score was now tied at 23. Murray responded with a tap over the frogs could not return to put it at set point, but Edwards negated that with a tap of her own. TCU followed with an attack error, but a lift error by U of C kept things even now at 25. The set now headed into “free volleyball” with neither team able to win by 25. TCU opened up an advantage with Irene Hester’s wallop. A serve out of bounds tied things out of bounds, and Kirk opened things up with a kill. TCU called a time out, but when play resumed a net violation put Connecticut up 28-26, giving them the set win. TCU 1, Connecticut, 2. It should surprise no one that the fourth set opened up to a ongoing back and forth to a 10-10 tie. TCU’s points came about through Irene Hester’s precision spike down the line, a Connecticut hit out of bounds, Hudson’s block, a home team spike out of bounds, Hudson’s tap over the net, some sort of Connecticut error, a U of C antenna contact, a serve out of bounds by the Huskies, a Irene Hester shot through the block, and a Edwards block. Connecticut put points came from in part, a TCU spike into the net, a Murray ace, and then another, a visitor spike out of bounds, Kirk’s massive cross court smash, a two hit error followed by a spike out of bounds, by TCU, and later a lift error. Farrell launched the ball off the blockers and out of bounds to gain the tenth point for the Huskies. Texas Christian grabbed a lead with a Edwards tap over the blockers. A Connecticut error followed, but Farrell unleashed another attack through the blockers to cut the lead in half. A net error by the Huskies, and a Kristen Hester kill put the lead at 11-14 though and brought about a home team time out. On the next play Kristen Hester tomahawked a Connecticut overpass, though Connecticut would picked up two straight points thanks to Mickens and Broadwater, only to spike into the net and keep the lead at 3 13-16. The chase would continue to a 16-21 score and another Connecticut time out. In the interim Hudson and Kristen Hester had picked up a block, despite a great defensive save by Munce, Broadwater blasted her kill off numerous defensed and out of bounds, and on the next play Blackwood’s defensive play did not stop a Lamberti smash. Each team traded blocks out of bounds, and Edwards scored two straight points, followed by Horio’s service ace. After the time out Connecticut picked up two points off attacks out of bounds, but Munce’s kill preserved the 18-22 lead. An attack error by the Horned Frogs got the Huskies back within 3, but a massively long rally ensued with everyone on each team probably making numerous key defensive plays too many too count. It was the zaniest back and forth of the tournament. It was ended by Quayle’s kill. TCU would pick up a point and then another off a Kristen Hester block. Quayle would find a gap, but an error on her team the next play placed the score at 21-25, TCU. TCU 2, Connecticut 2. The two teams had now extended their match longer than any in the tournament certainly setwise and it would soon be timewise as well. The two teams lined up for their 15-point race to the finish and play began. Connecticut benefited from two TCU attack errors, and Murray hammered in a TCU overpass. The Horned frogs got on the board when Edwards and Otto shared a block, and despite a good defensive save by Murray, Munce delivered a spike. Quayle responded with a huge blast, but TCU came right back with an attack Connecticut could not return, only to serve out of bounds following that, and block out of bounds after that. It was now 6-3 Connecticut. But TCU fired back with a good play by Blackwood setting the stage, Irene Hester then delivered a kill, another point would follow, and Connecticut then attacked out of bounds to bring the score to 6-6 and prompt a Connecticut time out. TCU picked up another point on a tap over , but Mickens responded with a kill to keep the score tied 7-7. Munce took the lead again with her kill, and the teams switched sides at the midway point. Kirk successfully sent another cross court kill in to even the score again. Despite a great save by Isaac, Kristen Hester dropped the hammer on a kill, and Irene Hester’s serve hit the net and dropped in for an ace. Lamberti’s kill was the Huskies response, and the Horned Frogs hit an attack out of bounds. The score continued to be tied as a Otto kill was followed by a visitor spike into the net. The home team regained the lead with a frogs hit out of bounds. TCU called a time out. Play resumed and Otto knocked the ball off the blockers, and her teammate followed the next play with a tap over the defense. The score was 12-13 and U of C called a time out as well. An attack out of bounds by the Huskies put TCU in set and match point mode, but they would spike out of bounds to place it at 13-14. Otto would end it with another kill 15-13, TCU 3, Connecticut 2.